So, you have a trench that needs digging or a post hole that needs drilling but there’s one issue, you can’t get any machines in because the worksite access is so tight. Don’t worry, we’ve got you covered with our Kanga Loader. The Kanga Loader is the perfect machine for tight access areas as it only needs a clearance of 850mm to be able to get into any site. From residential to commercial projects, this small worker is the machine for you. 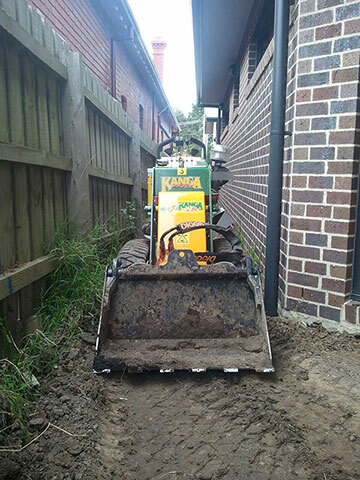 The Kanga Loader is not only small but can work on a range of jobs and is a great little asset on any job site. From concrete, paving and turf preparation to soil removal, the Kanga Loader can handle it all. Its wide variety of features and attachments make it a versatile machine. Its post hole attachment means all your post hold drilling needs are taken care of. The Kanga Loader also has a chain digger attachment to help you dig precise trenches fast. 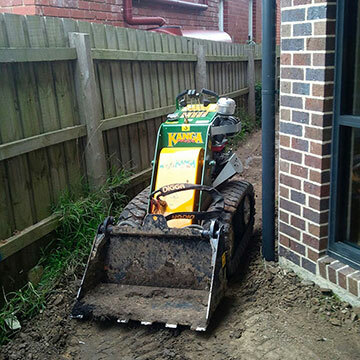 The Kanga Loader can also complete site levelling, soil removal and rubbish removal jobs. It’s great at getting sites levelled quickly and efficiently, it’s also an expert soil remover. We can also remove rubbish from your site and dispose of it properly for you using the Kanga Loader. Call Dial A Digger today to get a Kanga Loader and an expert operator who has the skills and experience to do any job you need. When hiring with Dial A Digger, you’ll receive prompt service, competitive rates and excellent same day service. We take on all jobs, large and small, residential and commercial. With every hire you’ll not only have a well-maintained and safe plant equipment, you’ll also have one of our certified and skilled operators using the Kanga Loader to it’s fullest potential. All our operators have years of experience under their belt and strictly adhere to OH&S procedures. We also have the connections to be able to supply and source all material you could possibly need for your project. So, give us a call today to discuss what Dial A Digger can do for you. Our service areas include Adelaide and Melbourne and their surrounding suburbs including Werribee, Dandenong, Seaford, Brighton, Tea Tree Gully and Munno Para. We’re ready to bring our Kanga Loader to your job site and provide you with our skills and experience to ensure your project whether it be site levelling or post hole drilling, is completed on time and on budget. Give Dial A Digger a call today.